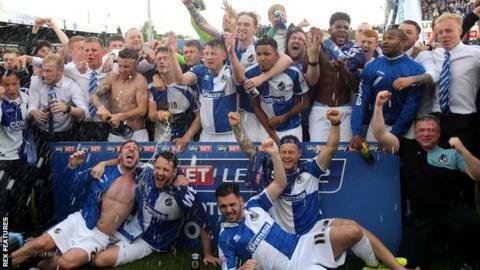 Bristol Rovers won promotion to League One in dramatic fashion on the final day of the season as they beat Dagenham & Redbridge, while closest rivals Accrington were held to a draw. Lee Brown struck Rovers' winner in stoppage time as they came from behind to win against the relegated Daggers. Billy Bodin had cancelled out Matthew Cash's opener and Rovers looked set to draw despite having 35 shots on goal. But Brown clinched the Pirates' second consecutive promotion on 92 minutes. Darrell Clarke's side, who were relegated to the National League on the final day of the season in 2014, began Saturday in fourth place, two points behind second-placed Accrington. Wins for both Accrington and Oxford would have left Rovers in the play-offs, but Stanley failed to beat Stevenage, meaning Rovers finished third on goal difference. Top scorer Matty Taylor spurned the best of the home side's many second-half chances before Brown's late twist. Throwing players forward in search of the winner, Rovers almost conceded but Brown cleared off the line to deny Dagenham. As full-time loomed, Taylor hit the post but the rebound fell to defender Brown, who netted to set off jubilant celebrations at the Memorial Stadium. Clarke's side lost just one of their final 14 games of the season to return to the third tier for the first time since being relegated in 2011. Bristol Rovers match-winner Lee Brown told BBC Radio Bristol: "It means the world to me. It means so much to so many people. "It just happened to fall to me. I was the lucky one. I'm just so happy it hit the back of the net. "What a group of players, I can't rate them highly enough. It's going to be a long night." Match ends, Bristol Rovers 2, Dagenham and Redbridge 1. Second Half ends, Bristol Rovers 2, Dagenham and Redbridge 1. Ellis Harrison (Bristol Rovers) wins a free kick on the left wing. Foul by Jimmy Shephard (Dagenham and Redbridge). Lee Brown (Bristol Rovers) is shown the yellow card for excessive celebration. Goal! Bristol Rovers 2, Dagenham and Redbridge 1. Lee Brown (Bristol Rovers) right footed shot from the centre of the box to the centre of the goal. Corner, Bristol Rovers. Conceded by Luke Pennell. Attempt missed. Matty Taylor (Bristol Rovers) right footed shot from the centre of the box is close, but misses to the left. Substitution, Dagenham and Redbridge. Oliver Hawkins replaces Andre Boucaud because of an injury. Attempt missed. Mark McChrystal (Bristol Rovers) left footed shot from outside the box is just a bit too high. Corner, Bristol Rovers. Conceded by Mark Cousins. Attempt saved. Jermaine Easter (Bristol Rovers) left footed shot from the left side of the box is saved in the bottom left corner. Attempt blocked. Christian Doidge (Dagenham and Redbridge) right footed shot from outside the box is blocked. Corner, Bristol Rovers. Conceded by Jack Connors. Attempt missed. Ellis Harrison (Bristol Rovers) header from the centre of the box is close, but misses to the right. Corner, Bristol Rovers. Conceded by Andre Boucaud. Attempt blocked. Jake Gosling (Bristol Rovers) left footed shot from outside the box is blocked. Jermaine Easter (Bristol Rovers) wins a free kick on the left wing. Substitution, Bristol Rovers. Jermaine Easter replaces Lee Mansell. Corner, Dagenham and Redbridge. Conceded by Mark McChrystal. Attempt saved. Matty Taylor (Bristol Rovers) right footed shot from outside the box is saved in the centre of the goal. Attempt saved. Ellis Harrison (Bristol Rovers) right footed shot from the right side of the box is saved in the bottom right corner. Substitution, Dagenham and Redbridge. Jamie Cureton replaces Ashley Chambers. Attempt saved. Matty Taylor (Bristol Rovers) right footed shot from a difficult angle on the right is saved in the bottom right corner. Attempt missed. Matty Taylor (Bristol Rovers) header from the right side of the six yard box is close, but misses to the right. Attempt blocked. Matty Taylor (Bristol Rovers) right footed shot from the centre of the box is blocked. Attempt missed. Ellis Harrison (Bristol Rovers) left footed shot from the centre of the box is close, but misses to the right. Corner, Bristol Rovers. Conceded by Frankie Raymond. Corner, Bristol Rovers. Conceded by Dominic Hyam. Attempt saved. Chris Lines (Bristol Rovers) right footed shot from outside the box is saved in the top right corner.